Last Updated April 21st 2019 If you are someone that prides themselves in working with their homes plumbing systems by fixing any issues or installing any new pieces, then good on you! I have always believed that people should try their best to work on any issues their home might have, and once absolutely necessary you can phone in someone else for help. Generally anything plumbing related can be a scary subject to approach, but once you learn the basics you’d be surprised in how much you can actually fix with a small set of tools. One of the main tools you will find your self needing is a crimping set. Because of this I thought I’d do a review of the best PEX crimp tool of 2018! 0.1 What is a PEX Crimp Tool Used For? 0.3 What Type of PEX Crimp Tool Do You Need? 1.1.1 Get the Lowest Price on Amazon! 1.2.1 Get the Lowest Price Today on Amazon! 1.4.1 Get the Lowest Price on Amazon! 1.5 PEX Cinch vs Crimp: Which is the Best? 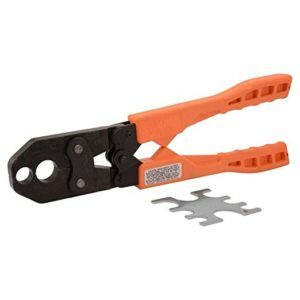 What is a PEX Crimp Tool Used For? As I’m sure you know, PEX pipes are used for quite a few different things in general interior plumbing along with repairs and fixes. PEX is becoming more and more used in indoor plumbing, and especially in toilets. If you notice a leak or water aroudn your toilet it could be a broken pipe which could be your signal to switch to PEX from copper, or it could be a broken toilet seal. And of course if you are using PEX pipes for your plumbing needs then you are going to need something to connect and cut these tubes to meet your needs. There are a few different ways to go about cutting and using PEX tubes, but generally a PEX crimping tool is the best way to go because of how easy and versatile it is. That being said if you have a serious reconstruction to do, you will need a PEX manifold as well. PEX Pipes are a good deal cheaper than copper pipes. PEX is easier and faster to install than copper pipes. PEX pipes won’t corrode like copper pipes might in certain situations. Overall I definitely suggest PEX pipes over copper or PVC, and if you are using a ball valve, then I definitely suggest PEX! What Type of PEX Crimp Tool Do You Need? 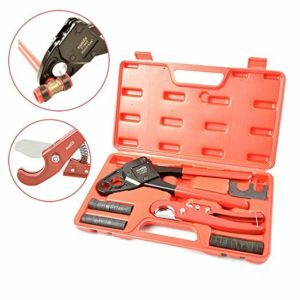 When you are looking for the best PEX crimp tool, then you definitely need to take a look at your needs, and the different types of tools available. Once you start looking at your local hardware stores you will see that there are quite a few different types of these PEX tools around. The main differences between the tools you will see, are the size of the tool itself and the size of the crimp. When you are inside your walls or under your sink, you start to realize just how little space you have. Because of this, it can be quite difficult to maneuver your way around to reach what you need to reach. Because of this lack of space, different lengths of PEX crimping tools have been developed. There are some that are designed to be one handed and for very tight spaces, and there are others that are made for larger more open spaces and are easier to use. Along with the actual size of the tool itself, there are some tools that crimp the pipe into different tube sizes. Generally they range for 1/4 inch – 1 inch. Of course this is important to know to make sure you match up the pipes to the correct size and that you use the correct size for whatever appliance you are working on. Because there are so many crimping tools on the market, it can be hard to know which one to pick. Thankfully for you guys, I have been through this path, and I have tried a few different tools. Because of this, I will leave you with my three favorite PEX crimping tools. I think this Conbraco PEX tool is one of the best on the market today! It is the set standard of not only quality but of craftsmanship as well. This is a very popular crimper because of it’s functionality. As we mentioned before, it is very important to know which crimping size you need for a certain job, well thankfully with the Conbraco tool, it has five different interchangeable sized heads (3/8 inch, 1/2 inch, 5/8 inch, 3/4 inch, and 1 inch). This gives you the ability to work on just about any PEX pipe without having to go out and buy a different sized tool. Overall I think this is a great tool, and I definitely recommend this tool to anyone who wants to do home plumbing! This easy to use tool allows you to have the variety to accomplish any task you come against, with an easy to squeeze design. Along with this, this tool is extremely durable, and it will last you years! My next review for the best crimping tool would be the tool made by IWISS. IWISS is an electrical and industrial tool company that has been around for about fifteen years. Their tools really have been known for their quality and their durability, which is just what you need for a tool that is gonna be in all sorts of situations. 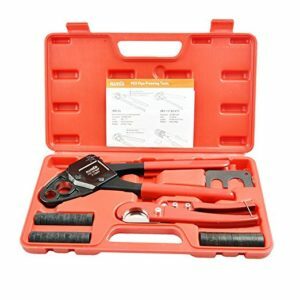 This tool is designed to be used with stainless steel crimps and copper crimps, which are the majority of the connectors you will find in stores anyways. Overall this PEX tool works with a huge variety of sizes of clamps which truly makes it a versatile tool. Along with this, this crimp tool is factory adjusted which means it doesn’t need any extra fancy tools to adjust and calibrate it before you can being working. In the end I definitely suggest this tool to anyone that is looking at doing some plumbing work in their home, it gives you the ability to work with pretty much any size without having to purchase another tool. Our final product review is of the SharkBite 23251 crimping too. This tool is designed for pet pipes, per fittings and copper crimp rings that measure 1/2 inch or 3/4 inch. 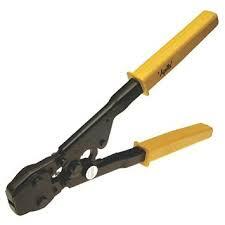 This is another quality crimping tool, that really makes the job quite easy. This tool features two different sizes without having to interchange or use tools to switch sizes. Doesn’t require any special tools to change the crimp sizes. Works with both brass and poly crimps. Comes with a Go/No-Go Gauge checker to ensure tight connections. Works with 1/2 inch and 3/4 inch connections. Overall this is an extremely quality product that I definitely recommend for someone that is looking for a new crimper. This tool can be seen as a little bulky by some, but it truly makes crimping extremely easy and you won’t have to worry about getting an extra workout. That being said, if you are looking for a quality product, then this SharkBite is the one for you! Our 4th review for these tools is the IWISS F1807 Combo Set, that comes with a truly innovative design, along with everything you will need to get started with your plumbing. IWISS is a great plumbing company that provides durable and high quality products, and the F1807 is no different. This kit truly comes with everything you might need to get started, and it provides it all with extremely high quality and a beautiful carrying case. I personally recommend the IWISS F1807 kit to anyone that needs a complete solution to crimping. Along with this, if you are looking for a crimper that is extremely easy to use while offering the ability to sneak around tight corners then this IWISS is the one for you! PEX Cinch vs Crimp: Which is the Best? When you are doing some research on the type of tools you’ll need, you will soon that there are two main types of PEX connections; Cinching and Crimping. 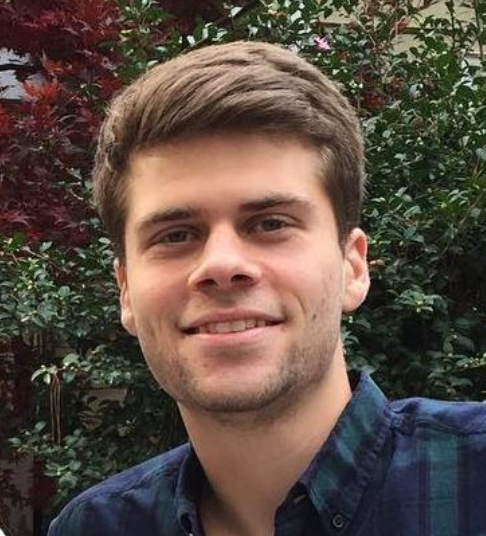 Both of these options have their advantages and their disadvantages, and depending on what type of work you’re doing, one of these options is better than the other. PEX crimp tools are the most common form of PEX connections, and they are the ones that have been around for many years. Crimp tools are when the metal connections are crimped, bent and formed around the two pipes with a crimp tool. This forms a few advantages and disadvantages over a cinch clamp tool. Cheaper: Generally speaking the connection pieces are cheaper than clamp connections. More Secure: Because the metal connections are actually bent around the connection area, the connection is actually tighter and more secure than clamps. Easy to Use: Because these are what many people are used to, these tools can be considered easier to use (Although clamps are pretty much just as easy). Crimp Tool Sizes: The main disadvantage of crimp tools is that you will need a different crimp tool size for every connection size. Although some tools feature multiple heads to fit multiple sizes, but it can be a hassle. Cinch clamps are a newer version of PEX connections, which are slowly but surely becoming more and more popular. Cinch Clamps are different from crimps because the metal connection isn’t bent around the piping, cinch clamps are essentially tightened around the pipe, and can be removed and reused. PEX Cinch Clamp Sizing: Because these connections are tightened to fit the specific piping, it means that one PEX Cinch Clamp tool fits nearly every size connector. This can save you money in the long run instead of having to buy a few different sized tools like with crimping. 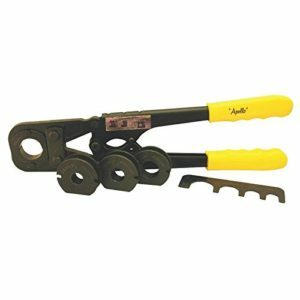 Easier to Remove Connections: Another great advantage is that with cinch clamp tools you can pretty easily remove connections if you made a mistake or you are changing your piping layout. Easier to Maneuver: Because of the layout of cinch clamps, the tool doesn’t have to wrap all around the pipe, which can make it easier to maneuver in tight spaces. Connections Cost More: The specific connections cost more than crimp connections. Not as Secure? : There are some reports that these connections aren’t as tight and secure, but I haven’t had any specific examples of this for me. Overall, when you are looking at dealing with some home plumbing, then you will need the right tools. Overall finding the best PEX crimping tool can be a difficult journey, but hopefully since I have been through it all before I could help to guide you in the right direction. I hope this buyers guide has helped you out a bit, and if you have any questions then shoot me a message or a comment below.